The Dubai hit exposes the failure of international law to fight jihadi terror, forcing the Jewish state to act independently. Al-Mabhouh was a cold-blooded murderer—in an interview just last year on Al Jazeera he boasted about kidnapping and then killing two Israeli soldiers. He was also a major figure in arranging arms shipments from Iran to Gaza. 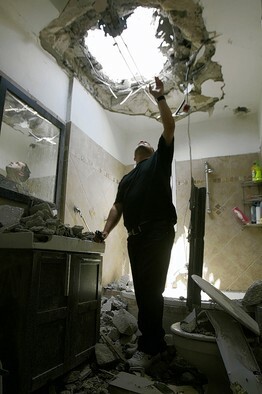 Al-Mabhouh shared responsibility for the thousands of rocket attacks fired at civilians in Sderot and other Israeli towns, which resulted in last year's war in Gaza. In his travels, the Hamas terrorist was probably making arrangements for the next round of attacks. But international law provides no means for stopping terrorists like Al-Mabhouh, or for his Hezbollah counterpart, Imad Moughniyeh, whose life ended with an explosion in Damascus in 2008. (In addition to numerous attacks against Israelis, Moughniyeh has been blamed for the 1983 Beirut bombings that killed hundreds of American and French peacekeepers and the murder of Lebanese President Rafik Hariri.) Cases involving Muslim terrorists, supported by Iran, would never be pursued by the prosecutor of the International Criminal Court, or raised in the framework of the United Nations. Al-Mabhouh violated the human rights of untold Israeli civilians, but the U.N.'s Human Rights Council—which is dominated by such moral stalwarts as Libya, Algeria, and Iran—has no interest in Israeli complaints. It is equally hard to imagine Interpol issuing arrest warrants in response to Israeli requests. And if warrants were issued, history shows that German, French, Belgian, and other European governments would not risk the consequences of acting on them. Little effort was ever made to apprehend the perpetrators of the Munich Olympic massacre, or of the deadly bombing attacks against synagogues in Istanbul and Athens. It's a widely known secret that European governments had ungentlemanly agreements with the PLO that allowed the Palestinians to operate from their territories, provided the terror attacks occurred elsewhere. Not until 2003 did the EU even put Hamas on its terror list. Hezbollah is currently free to operate in Europe. The bitter reality is that for Israel, international legal frameworks provide no protection and no hope of justice. Instead, these frameworks are used to exploit the rhetoric of human rights and morality to attack Israel. In European courts, universal jurisdiction statutes, initially created to apprehend and try dictators and genocidal leaders, are now exploited as weapons in the service of the Palestinian cause. In this way, Israeli defense officials are branded as "war criminals." Similarly, Richard Goldstone's predetermined "fact finding inquiry" into the Gaza war makes no mention of Al-Mabhouh or Iran, which supplied Hamas with over 10,000 rockets for attacks against Israelis. Mr. Goldstone and his team have remained silent about what would be the "legal" way to bring jihadi murderers to justice. In their efforts to demonize Israel, Palestinian terror actually doesn't really exist. The Goldstone team simply refused to accept conclusive Israeli video evidence of Hamas war crimes. The same legal distortions are found among the organizations that claim to be the world's moral guardians, such as Human Rights Watch. HRW's systematic bias is reflected in a Middle East division that sees no problem in holding fund-raising dinners in Saudi Arabia—one of the world's worst human rights violators and a country officially still at war with Israel—to help finance their campaigns against the Jewish state. In the absence of any legal remedies or Western solidarity, Israel's only option to protect its citizens from terror has always been to act independently and with force. When in 1976 a group of Palestinian and German terrorists hijacked an Israel-bound Air France plane to Uganda and separated the Jewish passengers, Israel decided to act. In a daring mission, it rescued all but three passengers while killing all terrorists and several Ugandan soldiers who had been protecting the terrorists. Back then, Israel's detractors also fretted about the "violation of Ugandan sovereignty" even though dictator Idi Amin was in cahoots with the terrorists. Entebbe, though, quickly became the gold standard for successful counter-terror operations. Only a year later, Israeli-trained German special forces freed in Mogadishu, Somalia a Lufthansa plane hijacked by Palestinian terrorists. Similarly, when after years of horrific suicide bombings Israel pioneered the targeted killings of Hamas terrorists—often with the help of unmanned drones—Israel's Western adversaries complained about "extrajudicial assassinations." Today, though, U.S. forces have copied Israel's technique with their own drone killings of jihadi terrorists in the Afghan-Pakistan border region. Unlike those Predator strikes, though, which hardly raise an eyebrow in the West these days, there was no "collateral damage" in the mysterious Dubai hit. No innocent civilians were hurt, no buildings were damaged. Justice was done, and al-Mabhouh's preparations for the next war ended quietly. All this is lost on those diplomats, "legal experts," and pundits who blame Israel for Dubai, and angrily denounce the passport infractions. In the absence of viable alternatives, and a refusal to share any of the risks, they are in no position to condemn actions aimed at preventing more terror. Mr. Steinberg teaches political science at Bar Ilan University and heads NGO Monitor.